Satisfying customer needs better than competitors is the key to revenue and equity growth. As a result, getting cross-functional teams to agree on how to define a customer need is critically important. Almost every company does not have an agreed-upon definition of a customer need, and this may be true at your company as well. This is a critical problem because research has shown that the number one reason for product failure is failure to satisfy customer needs. JTBD provides a clear and measurable definition of a customer need to help your team avoid the main cause of product failure. In Jobs Theory, a customer need is a metric customers use to judge how quickly and accurately they can execute the job. Every need in a job is defined by an action a customer must take and a variable that represents the elements of the job step that could cause it to go slowly or inaccurately. For example, to get a destination on time, drivers must determine which route to select, and they must determine the optimal sequence of planned stops, two of over 100 needs in this job. These actions and variables are the customer needs, and they are independent of any solutions. The customer actions in a need are defined by action verbs (e.g. determine, identify, gather, calculate, reduce, ensure, etc.). The time it takes for a customer to execute the action and the accuracy of the variable during execution of the job can both be measured. This is a critical insight in thrv's JTBD method: your team can identify and measure the cause of your customer's struggle and the cause of customer dissatisfaction. If a customer (a job beneficiary and/or job executor) cannot get the job done quickly and accurately, this causes customer anxiety and low customer satisfaction. When you can get the customers' job done more quickly and more accurately to overcome their struggle and reduce their anxiety, this causes a new customer purchase and leads to accelerated revenue and equity growth. With JTBD we have a stable, measurable, and actionable definition of a customer need. In order to identify customer needs, we first deconstruct a JTBD into different job steps. Job steps tell the story of what a customer needs to accomplish in order to get the job done. 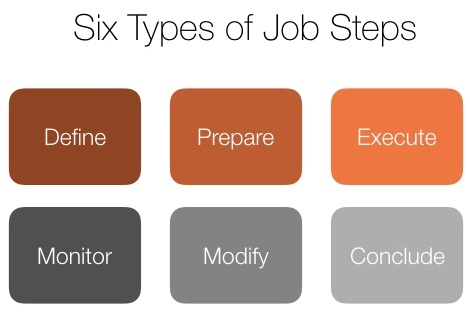 All JTBDs have 6-16 job steps, and every job step has 5-10 needs (actions + variables). As a result, every JTBD has ~100 needs that can be measured for speed and accuracy. Hypothesize the needs based on your own experience. If you and your team have experience executing the job, you can think through recent attempts at getting the job done. Ask each other, what were the things that needed to happen for the job step to go well? Make a list of the actions you need to take and the variables that affect the speed and accuracy of the job step. If the job step takes a long time or is frustrating, what causes that? Talk to customers. Once you have hypothesized the needs, interview customers to validate them and find other needs that you missed. If you have not hypothesized the needs before the interviews, you can identify needs by asking customers "What is difficult, frustrating or time-consuming about getting this job step done?" 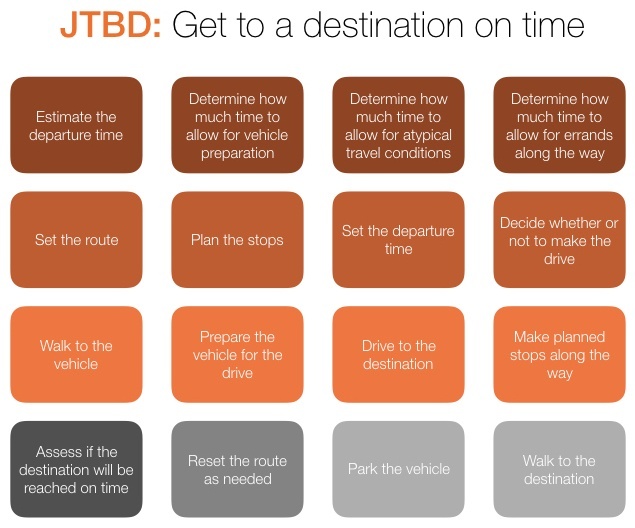 Table 4 illustrates five needs in the step of "planning the stops" when getting to a destination on time. Each need has a customer action (e.g. determine) and a variable (e.g. optimal sequence, routes, amount of time). Each need, like the job itself, is free of any solution statement. Customer needs, like the job, are therefore stable over time and will not change. Your product team will now have a stable target to hit: satisfying customer needs in the JTBD. Need: Determine the optimal sequence to make the stops. Need: Determine the routes to make planned stops. Need: Determine the amount of time added to make stops. Need: Determine if parking is available at the stops. Need: Determine if the location will be open when arriving.